Among the few great names which have most signally emblazoned the pages of history, and whose fame and influence have not been limited to their own age, country, or people, that of Augustine, saint and bishop, stands out pre-eminently as worthy of all the encomiums bestowed upon him by serious students of men and their times. He has been and is regarded as the greatest and most celebrated of theologians, the father and master of preachers of the Divine Word, the peer of the rarest and most enlightened minds, whose soaring is above all time. He has been given a place with Plato and Bossuet, with Cicero and St. Thomas, in the universal acclaim. Great in faith, great in thought, great in virtue, great in genius, he lived in the century of great men, towering above all. Athanasius was Patriarch of Alexandria and Cyril of Jerusalem; Gregory of Nyssa, Gregory of Nazianzen, and Basil the Great, formed a triumvirate of holy, eloquent, and erudite defenders of truth and justice; Ambrose was by his faith and piety illumining the See of Milan; the Christian Cicero, Chrysostom, was pouring forth at Constantinople streams of golden eloquence; Jerome, the hermit of Bethlehem, was giving his masterly expositions of Scripture. And Augustine arose in this galaxy of greatness and genius to shed glory on the land and church of Africa, which had seen its Tertullian and been adorned by its Cyprian. Contact with such men were an honor; drinking at their feet deep and wholesome draughts of purest wisdom were glory: but to have the notes of one's song arise above theirs as did Augustine's, were solid genius and lasting fame. St. Augustine was born on November 13, A.D. 354, at the little town of Tagasta, in ancient Numidia, which is now Algeria. His father was an unassuming and honorable soul, though of humble and modest origin. His mother was the sainted Monica, who is so justly venerated on Christian altars. The early education of Augustine was received in his native village, with slender means and amidst meagre advantages. As a boy he manifested very little of those studious habits which were afterward to distinguish and elevate him to universal honor. At great sacrifice on his father's part, and with the princely generosity of a noted inhabitant of Tagasta, named Romanian, he was sent to the better equipped schools of the neighboring Madaura and later to Carthage. The schools of Carthage, though not so renowned and exceptional as those of Alexandria and Antioch, were yet among the most prominent of the Roman World. He was sixteen years of age when he was taken to this city, and after four years he had risen to the first place in the schools of rhetoric and had mastered all the branches of the liberal arts then taught. None could equal his penetration, none surpass him in the readiness of his answers or in the clearness of his expositions. The subtle distinctions and divisions of Aristotle were plain to him. And in the arena of philosophical disputation he knew no superior. He was particularly attracted to the study of eloquence; and the perusal of Cicero's "Hortensius" (which unfortunately has been lost in the vicissitudes of time) stirred his soul to higher flights and begot a noble enthusiasm for the imperishable beauty of wisdom, made him impatient of the evanescent hopes of men, and carried him onward to further quest of truth. When his studies were completed, he returned in 370 to Tagasta and lodged with his wealthy patron and benefactor; for his father had died the year after his arrival in Carthage. Though here he began to teach grammar and kindred branches, he did not long remain at home; he soon departed again for Carthage, where his successes as a master surpassed those he had gained as a disciple. Led by his former fame and by the daily increasing applause which greeted the youthful professor of rhetoric, many gathered around him. He was then only twenty-three years of age. Among his pupils he numbered Licentius and Alypius--two names indissolubly bound up with the story of Augustine's life. His place among the learned and first men of that ancient city was made doubly secure when, at a public contest in poetry, he was awarded the prize, and was crowned with the laurel by the Proconsul, Vindician, before the assembled people and most celebrated minds of the city. But while he was thus advancing in favor with men, while thirst for truth was burning him, he yielded to the seductions of the wealthy youth of his time; though he had been early trained by his pious mother in the love of virtue and the hatred of iniquity, yet the apparent austerity of virtue seemed now to affright him, and the pleasures of life and the allurements of vice captivated his ardent disposition; and while he never seems to have plunged into the extravagances and disorders common to so many of his companions, nor to have been guilty of crimes which spring from a cruel nature or very depraved instincts, he indulged in some pursuits which formed the prolific source of future profound grief. He loved ease, and was averse to self-denial and hardship--hence his indiscretions and follies. But the most distinguishing trait of his character was his honesty, and this feature redeemed and palliated his few irregularities. 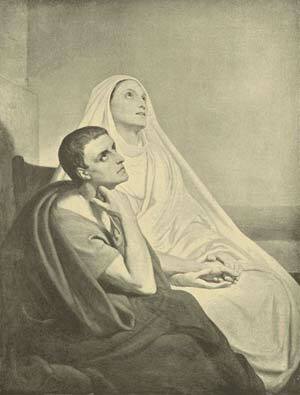 St. Augustine and his mother, St. Monica. The scholars of Carthage were anything but sober, industrious, modest, and orderly youths. They were indocile and turbulent; not only disturbing by their wild pranks the peace of the city, but interrupting by their noisy behavior and inattention the master's discourses and lectures. It was next to impossible to preserve any semblance of discipline in the classes. So Augustine left in disgust and set out for Rome, the ancient mistress of the world. He had been enamoured by her imperishable traditions and magnificent monuments of grandeur and art, by her memories of numerous great men, their genius and their works, by her history ever rich in majesty and glory. Induced by the consideration that he would find there the absence of unfavorable circumstances and the presence of stronger incentives to enthusiasm and high inspiration, he left his country and his mother, and in 383, with Alypius, his friend and pupil, he departed for this metropolis. But again he was doomed to disappointment. Though disciples were not wanting, and his chair was surrounded by a throng of earnest and strong students, he did not find the all-absorbing passion for wisdom and truth, for the sublime and beautiful, that he had fondly anticipated. There was not, indeed, the same degree of turbulence and disorder as at Carthage, but the magnificence and ostentation of the Roman family and life, their splendid palaces and festive orgies, could not but prove very injurious to habits of study. The youth had imbibed the venal corruption everywhere prevalent. Hence it not seldom happened that Roman scholars conspired to rob their master of his salary and desert his class in a body. Roman vileness and baseness disgusted Augustine even more than Punic insubordination. He therefore took advantage of a request made by the citizens of Milan of Symmachus who was then Prefect of Rome, that he would procure for them a professor of rhetoric. He accepted the proposal; and toward the close of the year 384 he was teaching at Milan. Up to this time the soul of Augustine was not influenced by higher inspiration than pleasure, nor his mind by anything which did not correspond to his preconceived notions of philosophic accuracy. Nor was he yet a Christian by baptism, as it was the custom of the age to postpone the reception of this sacrament till later in life, both that it might be received with better dispositions and more fruit, and because sins and faults committed by the baptized possessed in their eyes and before God deeper malice and blacker ingratitude; they wished to avoid this evil. When a child, Augustine was so ill that his life was despaired of; the waters of regeneration were about to be poured over him; but he soon recovered and again the baptism was deferred. In Milan he was attracted by St. Ambrose's eloquent discourses on the Christian religion; and their simple and earnest character, their strong and convincing argument, their fervid and impassioned vein appealed to the young man's mind. His heart was touched by the manifest holiness of the good bishop's life and conduct, especially when he contrasted them with those of the Manicheans with whom he had so long been associated. The study of Platonic philosophy urged him on to celestial heights and made him gaze on the infinite nature of God. The Epistles of St. Paul riveted his attention in his search after purest truth, and joined to the pious prayers of the Sainted Monica, who thus drew down abundant grace divine, completed the miracle of his conversion. The wayward Augustine wept for his sins, the learned philosopher bowed his head in faith and humility before the Gospel of Jesus Christ and the truth of God as revealed by Him. After a period of seclusion which he spent from August (386) to the Easter solemnity of the next year, with Monica, Alypius, Licentius, and several others, at Cassiciacum in the suburbs of Milan, he was baptized by St. Ambrose on April 24th or 25th, A.D. 387. Once a Christian, Augustine thought of returning to his native country. He desired to perfect himself in the Christian science and spirit, and to teach and defend among his own people Catholic doctrines and interests--henceforth to be the sole aim of his life. In August or September therefore of that same year he set out with his mother and friends for Africa. But the death of Monica at Ostia in Italy changed his plans. And after paying all the duties of religion and filial tenderness to this devoted mother, he went to Rome. But in the spring of the year 388 he finally set foot on his native shores. He betook himself immediately to the environs of Tagasta and found an asylum for study, contemplation, and prayer. It happened that, prompted by zeal and affection, he went on one occasion in 391 to Hippo, which was on the Mediterranean Sea five leagues from Carthage, and the site of the present Bona, for the purpose of inducing a certain friend to join him in his solitude. While here he entered the church where the holy bishop, Valerius, was preaching to the people and complaining of his sad need of a priest to aid him in his duties, and especially to exercise the office of preaching, since an impediment in his speech rendered that duty very difficult and extremely painful for him. Preaching was the exclusive function of the bishop. 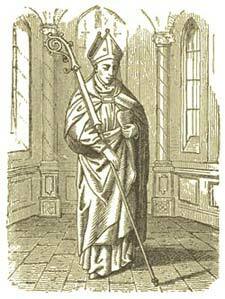 And when Augustine as a priest assumed the duty, he was the first in priest's orders who had ever preached in presence of a bishop. And it was in that capacity that he arose in the Council of Hippo (393) and delivered his famous discourse on "Faith and its Creed." As Augustine entered the church while the bishop was making the above complaint, the congregation, who recognized him (for his fame had spread over all Africa), immediately, as if by divine inspiration, proposed him for the office of priest. Valerius was of course overjoyed; and after a short time which the saint requested for preparation, he was ordained and attached to the church of Hippo. The esteem in which the new priest was held, his apostolic labors, his eloquence, his piety, soon impelled the aged bishop to raise his sacerdotal co-laborer to the episcopal dignity and associate him still more closely with himself in the government of the See of Hippo. He was accordingly consecrated a little before Christmas of the year 395. And the subsequent thirty-five years were the busiest, the most arduous, and the most fruitful of his long and eventful career. His energy was indefatigable and extended in every direction. The religious movements of his time brought into play all the resources of his mind and heart. He combated heresies and reclaimed heretics. His correspondence embraced a multitude of subjects and was carried on with various parts of the Church. His zeal in preaching never knew rest, and his efforts in instructing the ignorant were ceaseless. He established centres of religious life for men and women, and composed for them a rule of life and spirit and principles that have not yet died. He was alive to the necessity of a zealous and energetic clergy whom he wished trained in the spirit and teachings of the Gospel maxims and counsels, and therefore formed the nucleus of a monastic clergy. He had begun the realization of this idea in the community which he established at Hippo just after his ordination as priest, and he perfected it when he was made bishop. Ten of those whom he trained in this his first monastery, became bishops of the various sees of Africa, including Alypius, who was sent to Tagasta, Possidius, his first biographer, and Fortunatus, who was his successor in the See of Hippo. During all this time he continued to wear the long black robe and hood and leathern girdle peculiar to the cenobites of the East, which he had donned at Milan shortly after his baptism when he laid aside the dress of his native Africa. Not only his vesture but also his daily life and practices were the same as those which are the privilege and glory of monks, nuns, and hermits. None surpassed him in austerities and self-denial, as none had surpassed him in philosophic lore at Carthage, and at Milan and Rome. The magnificent effects of his extraordinary gifts, fertile ingenuity, and deep learning and broad mind; the influence of his genius on the thoughts and ideas of his own and succeeding ages, may be best gleaned from a brief survey of his writings. Augustine's early aim was to seek truth. He was perplexed with many doubts; he could not conceive the existence of anything real outside of physical bodies; and nothing around him completely and satisfactorily gave him answer. The Manicheans, who had occupied themselves with questions on the nature of God, the creation of the world, and the origin of evil, seemed to have attained on these points some tangible conclusions. For want of better Augustine defended their doctrines without participating in the excesses which distinguished those sectaries. But he felt himself alienated from them, partly because of the lack of the prestige of great men among them, and because he found Faustus, a Manichean bishop and the Goliath of their forces, ignorant of many simple subjects, and unable to give but vague and shallow responses to the questions that agitated his soul. He afterward had a famous controversy with this Faustus, and wrote against him thirty-three books. The results of Augustine's studies were that he was able to refute their attacks on Holy Scripture which they said had undergone serious changes, and to see the falsehood of their main postulate that good proceeds from a good principle and evil from an evil principle; and also to recognize the futility of their objection that the Christians spoke of a human form in God. Against this sect his principal writings are "On the Manners and Customs of the Catholic Church and those of the Manicheans;" "The Utility of Faith," "The Two Souls," and a book against Adimantes, the disciple of Manes, in which he reconciles the contradictions alleged to exist between the Old and the New Testament. From the Manicheans Augustine turned to the Academicians, who were a philosophical sect, and pretended that it was impossible for man to come to the possession of truth. Augustine had many conferences on this subject with his friends in his retreat at Cassiciacum: and the outcome was two books "On Order," and one on "The Blessed Life." These works discussed the matter thoroughly and left the philosophers no loophole of escape. A more dangerous error, though purely local in its immediate surroundings, was the denial of the validity of Baptism when conferred by heretics. This contention had occasioned a schism in the church of Africa since the beginning of the fourth century. It received the name of Donatism from Donatus, schismatic Bishop of Carthage, who had been aided by another Donatus of Casae Nigrae. In St. Augustine's time it had spread over the whole country. The Saint put forward the true idea of the Church and showed that the minister of a sacrament does not communicate to the recipient his own character of holiness or of guilt, that it is Christ Himself who baptizes and absolves and gives efficacy to sacramental signs. The cogency of his words, the clearness of his explanations, and his grace of manner led many of the Donatists to desire union with the Church, which he showed them, as Christ's Body, is one and indivisible. His chief works in this controversy are a letter to Maximinus, a Donatist bishop whom he brought back to Catholic Unity, the "Christian Combat," the "One Baptism," three books against Parmeian, letter to Glorius and three others, and a conference with Bishop Fortunatus, at Turbusum. As if by divine inspiration he had laid down in a work on "Free Will," which he had begun at Rome, enlarged at Tagasta, and completed in 395, principles which afford sufficient answer to the errors of Pelagianism. This heresy broached novel teachings on man, the fall, and the state in which that fall had left the human race. St. Augustine, who had not been able to take part in the council of Carthage, where Pelagius was first condemned, brought out in clear light the true doctrine and nature and action of supernatural grace, and the effects of original sin on man's will and heart. His treatises on "Merit" and the "Remission of Sins," explained all the weakness of fallen nature, the need of divine grace to perform actions that conduce to eternal life, and the necessity and place of human effort in the work of justification and faith. As it was asserted that children should not be baptized because the sin of Adam was not transmitted to them, he wrote a book on the "Baptism of Children." In "Nature and Grace" and "Faith and its Works," "On the Grace of Jesus Christ" and "Original Sin," still further explanation and argument are given to establish Catholic truth. Still another heresy was beginning to poison religious thought: Arianism, or the denial of the divinity of Jesus Christ, was invading the church of Africa. And the writings of St. Augustine against this movement are among his most luminous and brilliant works. He wrote three letters and fifteen books on the Trinity--these he commenced in 400 and completed in 416. Perhaps the clearest and plainest are the one hundred and twenty-four treatises (so called) on the Gospel of St. John, and ten on the First Epistle of the same Apostle. They were sermons or catechetical instructions and homilies, delivered during the year 416 to his flock, on the prevalent heresies but especially on the Arian. And his response to the five questions of Honorius, a citizen of Carthage, contains lucid expositions of some difficult portions of Scripture. On Scripture matters, besides the works just mentioned, St. Augustine's enlightened views are found in twelve books on the "Literal Sense of Genesis;" in these he seems to have divined all modern objections and theories about this work of Moses. On the seven first books of the Bible, he has left us seven treatises. "An Explanation of the Psalms," a correspondence with St. Jerome on the Epistle to the Galatians, four books on the agreement of the Evangelists, two on Gospel questions, and a book on "Things That are not Seen," should not be unknown to Biblical students. Nor was the Pagan attitude toward Catholic Truth forgotten. He had passed through the phase, and knew the Pagan mind. He put down their difficulties, reasoned away their doubts, threw light on their darkness, led them on in truth, in "The True Religion," "Eighty-three Questions," "The Christian Doctrine," and an early treatise on the "Immortality of the Soul." But by far his greatest and most enduring works are his "Confessions" and "The City of God." The former, at once a poem, a history, and a treatise of philosophy, beautifully expresses the trials and efforts of a human soul striving for truth and happiness away from God, and the ecstatic sentiments of the same soul on the attainment of both truth and happiness in the faith and virtues of Jesus Christ and in His Gospel. The other, in eloquent and philosophical vein, discourses on the Church of God on earth and in heaven; shows the hollowness of all opinions, thoughts, and efforts contrary to the eternal order which is God; is, as it were, an encyclopedia of all that he had written before, an exhaustless summary of refutation against heresy and paganism, and an analysis of the glories and benefits of Christianity. St. Augustine in its composition occupied all the time from 413 to 426--the period of his momentous struggle against Pelagianism. The lines of intellectual and religious thought which called forth the just mentioned and other productions of St. Augustine's brilliant genius, have continued all along the centuries even till now. The same movements exist; the same tendencies, though more intense in their working, actuate men toward truth; and the same obstacles impede their progress; objections, in other forms perhaps, yet substantially the same, are urged against the very points against which the sainted pontiff wrote and struggled--God, Creation, the Bible, Christ, human infirmity or human strength, man's power to attain truth unaided, and his freedom from any supernatural dependence. No wonder that Augustine, who had passed through all these phases of action, should have always been called upon for effective weapons in the warfare, and that he should have been the supreme authority in such questions for many an age in the Latin or Western Church. His sounds are as clear to-day, and his arguments are as convincing and potent. The student and the dialectician and the theologian can ill afford to be unfamiliar with the great doctor's thoughts. All these writings everywhere evidence the beauty of his character, as his actions were ever in accord with evangelical perfection. There is wonderful power of mercy, compassion, and love, in all. He had been weak himself, hence he treated weakness with gentleness. Two things rendered him indulgent; a sad experience of the infirmities of human nature, and a profound knowledge of the depth of those infirmities. His virtues of humility, compassion, moderation, and generosity, all sprung from that, just as his deep faith and strong convictions of Christian truth were begotten of his fierce struggle with doubt and error and his long and ardent search for truth. He died in honor on August 28th, A.D. 430. But men have not ceased to admire his genius, appreciate his labors, love his character; and thousands imitate his piety and are governed by his mandates of spiritual life.